Welcome to a world where obscure information is crucial to survival, vast sums of cash are at stake, and mere milliseconds can change not just a game, but the course of your life. Prisoner of Trebekistan is Bob Harris’s hilarious, insightful account of one man’s unlikely yet epic journey through Jeopardy!, gleefully exploring triumph and failure, the nature of memory, and how knowledge itself can transform you in unpredictable ways—all against the backdrop of the most popular quiz show in history. 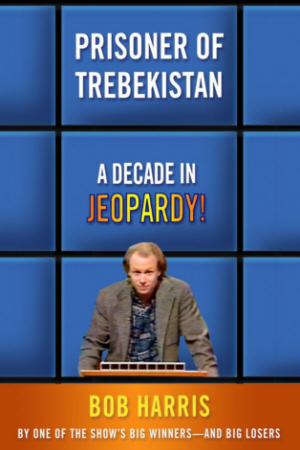 In Prisoner of Trebekistan, Bob chronicles his unlikely transformation from a struggling stand-up comic who fails the Jeopardy! audition test roughly five times (he honestly can’t remember the exact number) to an elite player competing against the show’s most powerful brains. To get there, Bob embarks on a series of intense cram sessions, using his sense of humor to transform conventional memory techniques into playful tricks that are as amusing as they are powerful. What follows is not only a captivating series of high stakes victories and defeats on Jeopardy!, but also a growing appreciation of the borderless world that Bob calls Trebekistan, where a love of learning reigns and the smarter you get, the more you realize you don’t know. Besides being filled with secrets that only a veteran player can share — from surprising betting and game-play strategies to subtle Jedi-like tactics with the Jeopardy! signaling device — Prisoner of Trebekistan also provides an inside-the-head view of exciting high-level tournament games (including Bob’s hysterical seat-of-the-pants inner thoughts) with the actual clues that led to victory or defeat, and candid, moving reflections on how the games affected Bob’s offstage life — and vice versa. The result is not only an irresistible treat for Jeopardy!fans, but a delight for anyone who loves a rollicking tale that celebrates the unpredictability of life and the sneaky way it has of teaching us the things that really matter. “Prisoner of Trebekistan” is so effortlessly funny and informative, the fact that it’s also tender, human and very wise kind of sneak up on you. Bob Harris has snuck a quirky and fascinating personal narrative into his pop culture ‘expose’. Amidst the nerve-wracking Jeopardy showdowns and hilarious study rituals he has found the difference between facts and knowledge, between knowledge and wisdom, and proved conclusively that the answer to the meaning of life may very well take the form of a question. A must for anyone who loves Jeopardy, or has ever seen it, or is breathing. Bob Harris is one of the funniest and wisest writers I know… I will be astonished if this is not a huge bestseller. If super-intelligent aliens demanded to interview one member of our species to see if we were entertaining enough to be allowed to continue, I would nominate, with all my powers of persuasion, Bob Harris.